Two days left, and today was the final day where campaigning was allowed, as campaigning is restricted on the day before an election. Tons of news to report on. Hitler made an appearance today in Ahmadinejad's speech where he said his rivals were using "Hitler's tactics" and could face jail for insulting the president. 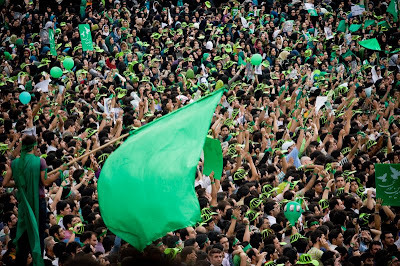 A nice article here shows what it's like to be right in the middle of all the campaigning and celebrating in Tehran that starts at 7 pm and goes until 4 am the next morning. University students and Mousavi supporters - "WTF, there's the president! Everybody chant Ahmadi bye-bye!" I love this election. Big surprise - Mousavi and Karroubi decide not to go on tv when Ahmadinejad gets 20 minutes to speak, and plans were to give Mousavi and Karroubi a bit over one minute (!) to state their case. Deeming it a waste of time, they attend rallies instead. Let's see if I can find the exact numbers again...ah, here they are. The plan was 20 minutes for Ahmadinejad, 1 minute and 41 seconds for Mousavi, 60 seconds for Rezaei, and 1 minute and 16 seconds for Karroubi. There's also a good writeup here on Daily Kos with some numbers.